[SatNews] EM Solutions, a Brisbane, Australia, based designer and manufacturer of broadband satellite communications equipment, was announced today by the Minister for Defence, Senator David Johnston, and the Assistant Minister for Defence, Mr. Stuart Robert, as the recipient of a grant under Round 18 of the $13 million Capability and Technology Demonstrator Program. Managed by the Defence Science and Technology Organisation, the CTD program supports Australian industry to develop and demonstrate new technologies that could contribute to Defence capability. Dr. Rowan Gilmore, Managing Director of EM Solutions, said, “This award will enable EM Solutions to develop a third-generation, mobile wideband satellite communications terminal. Using the company’s proven satellite acquisition and pointing technology, and its broadband radio systems, this terminal will have the potential to roam between WGS (X-band and Ka-band) and commercial Ka-band satellites depending on location and weather in the same way that a mobile phone can roam between cellular networks”. “We are excited to be working with the Australian Defence Force once again to develop leading edge technology that we can take to the world. This award is a wonderful initiative and a great opportunity for the company to develop an innovative local high technology product,” Dr. Gilmore said. Queensland Government Defence Industries Envoy, Lindsay Pears, said, “This is another example of SATCOM innovation from EM Solutions, building on their global reputation for excellence in this field. 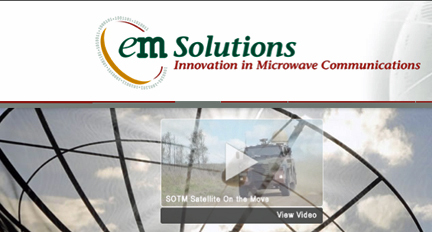 EM Solutions has proven performance in development and delivery of a wide range of complex RF products ranging from subsystem elements of phased array radars or satcom on-the-move technologies. One of the quiet achievers in the defence electronics sector, EM Solutions is a great example of a Queensland SME acting globally and thinking locally." The CTD project is planned to commence in mid-2014 and be completed by the end of 2015. EM Solutions infosite is accessible via.